The Ultimate Mixing Set, Daniel Smith half pan palette. The new Daniel Smith 15 half pan Ultimate Mixing Set is due to be launched in mid October 2018. I thought I'd put together some of the many mixing diagrams, charts and wheels that I've created over the years I was developing this set. Some have been posted up before, others are new. 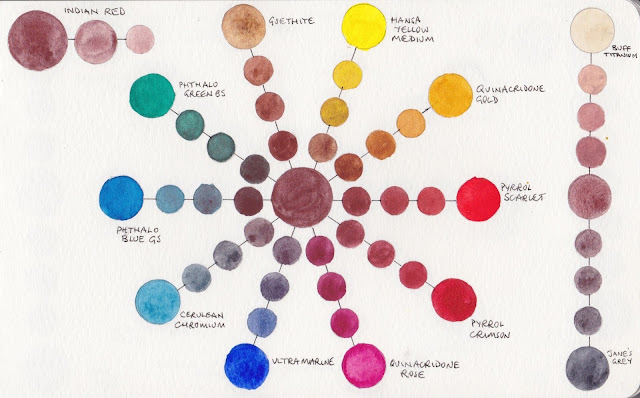 Note that in my charts I've used Pyrrol Crimson while, for technical reasons, the pan set contains Permanent Alizarin Crimson - they mix in almost exactly the same manner. Here is the full DS half pan set painted out. The Daniel Smith Ultimate Mixing Set painted out. I love Buff Titanium. It is a fabulous pigment for landscape and buildings, marble and some botanicals. It's a unique colour and I love the way it mixes with Goethite to make wonderful sandstone and beach effects. Mixing with Buff Titanium. Daniel Smith Watercolours The Ultimate Mixing Set. You can find more on buff titanium here. Mixing with Burnt Sienna. Daniel Smith Watercolours The Ultimate Mixing Set. Indian red, the most opaque watercolour in the set, is lovely in portraits and landscapes. I'd rarely use it full strength but I love the granulation and the soft dusty rose hues you can create when you dilute it. Here is is mixed with most of the other colours. Mixing with Indian Red. 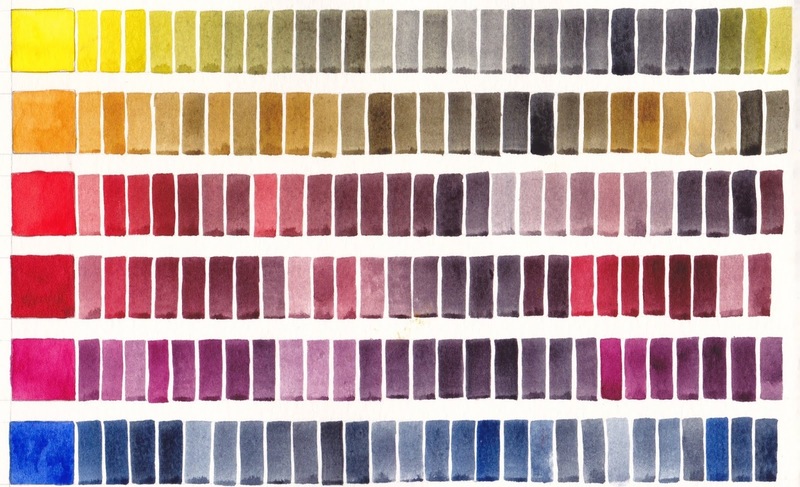 Daniel Smith Watercolours The Ultimate Mixing Set. Phthalo green is best mixed rather than used alone. 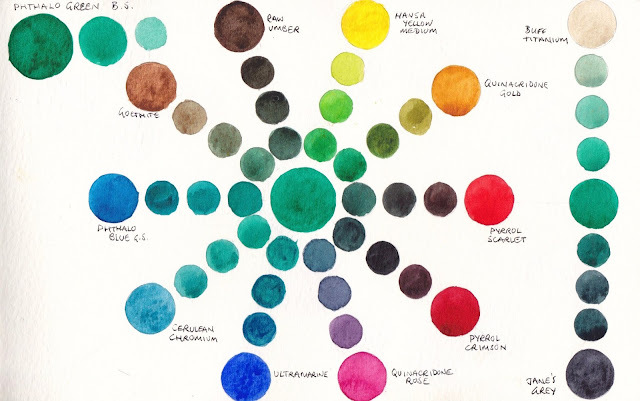 Here are some of the many colours it can create. 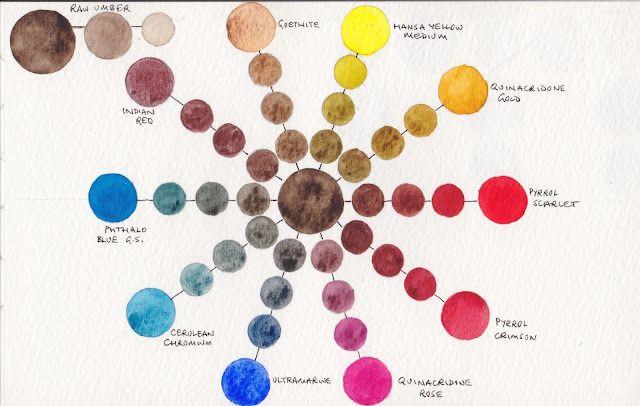 While it is wonderful for mixing a range of greens with the yellows, it is also worth exploring the colours you can create mixing it with the other earth colours and reds. Mixing with Phthalo Green. Daniel Smith Watercolours The Ultimate Mixing Set. One of my favourite mixes with Phthalo Green is with its opposite, Pyrrol Crimson/Permanent Alizarin Crimson. You can see the wonderful range of deep greens, aubergine, greys, maroons and a rich black that I often premix, called Jane's Black. The deep green mix can be created with the palette colours, or you could add Perylene Green. 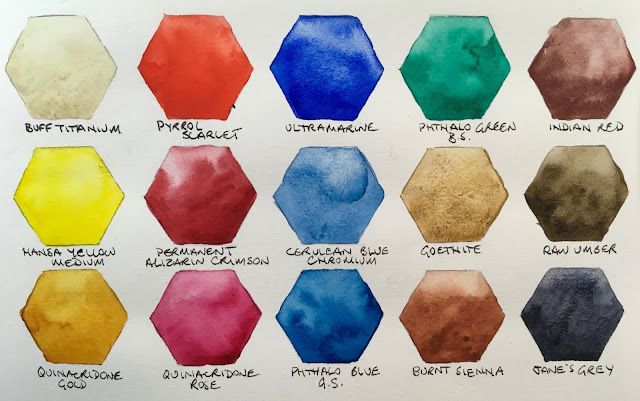 Fabulous mixing pairs - Pyrrol Crimson/Permanent Alizarin Crimson and Phthalo Green BS. 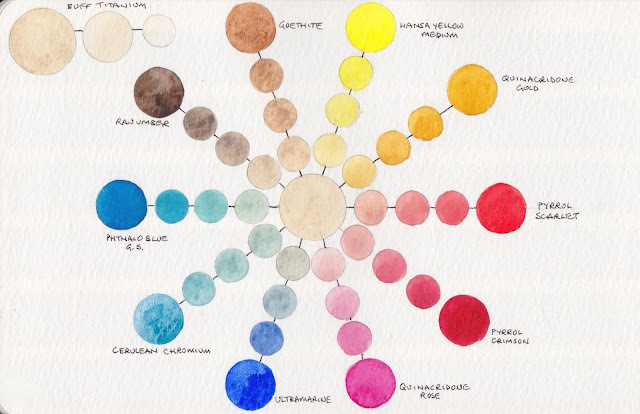 Daniel Smith Watercolours The Ultimate Mixing Set. Another great mix shown here is Phthalo Green and Quinacridone Gold. This makes a really useful range of realistic foliage greens, including the DS Sap Green hue. Mix it yourself or add this great colour to save time as you paint. Useful realistic greens using Phthalo Green and Quinacridone Gold. Daniel Smith Watercolours The Ultimate Mixing Set. Raw Umber is a deep cool brown - great for shadows of trees and figures, leaf litter and deepening other colours. In some brands it is a rather insipid colour but the DS version is very dark. Mixing with Raw Umber. 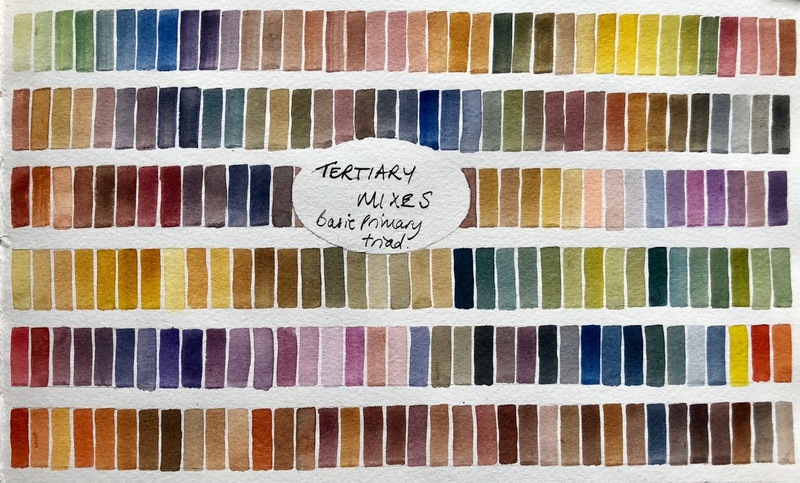 Daniel Smith Watercolours The Ultimate Mixing Set. Another of my favourite or most used mixes is Ultramarine and Quinacridone Gold. This is available as a premixed Daniel Smith colour called Undersea Green - one of my favourite premixed greens, or it can be created as needed from the palette colours. I love this range of olive greens, which are especially useful for the colours of gum trees or distant trees in a landscape. Quinacridone Gold mixed with Ultramarine, Daniel Smith Watercolours The Ultimate Mixing Set. Jane's Grey, the new Daniel Smith colour, can be used as a a shadow or sky colour, or as a neutral tint to deepen other colours, as well as being a beautiful granulating and non-staining grey on it's own. 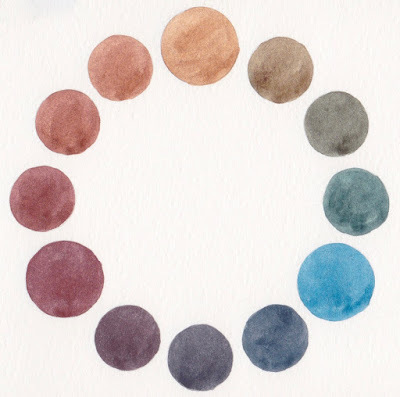 As it is made from burnt sienna and ultramarine is contains no black pigments, is transparent and granulating. It won't stain so you can lift it off or soften shadows. Here it is mixed with most of the other colours in the set. See more on this here. 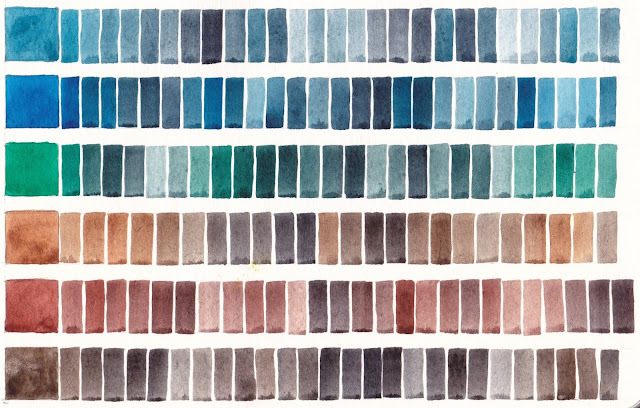 Mixing each colour with Jane's Grey. 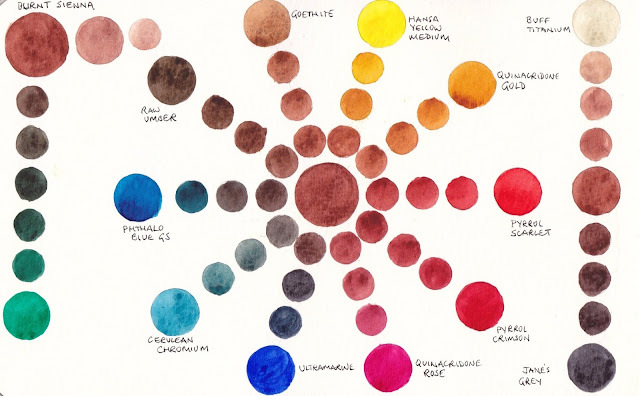 Daniel Smith Watercolours The Ultimate Mixing Set. Within the set there are also many great primary triads to explore. 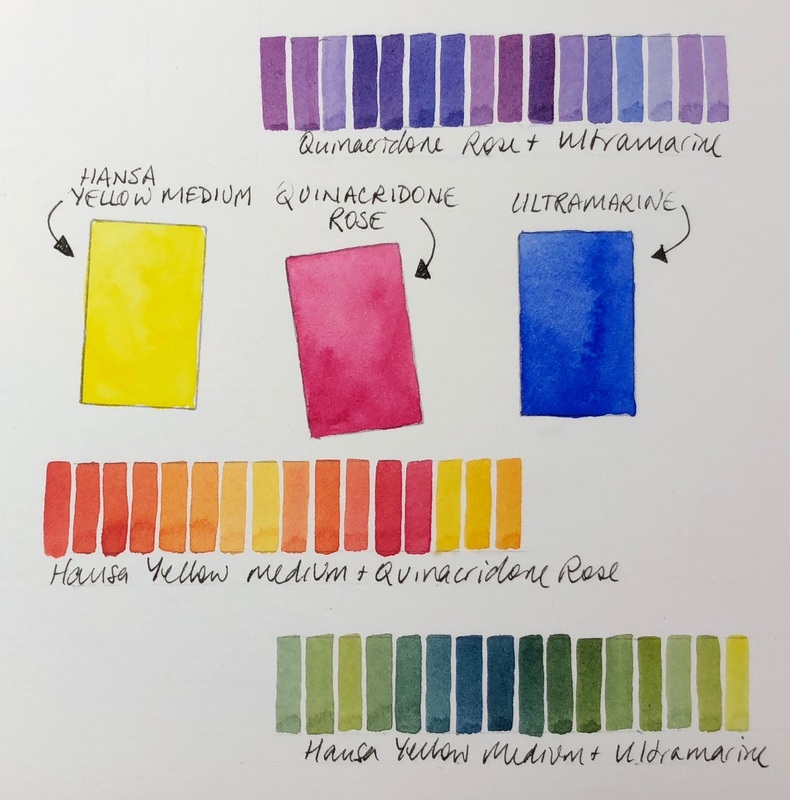 The first is a great basic triad - Hansa Yellow Medium, Quinacridone Rose and Ultramarine. You can mix lovely oranges and red, purples and realistic greens with ease just by mixing two together. But it gets really interesting once you mix all three in various ratios. Here are just some of the possible three-colour mixes you can create with this triad. If you start with the above triad and change Ultramarine to Phthalo Blue (green shade) you'll have a staining triad with no granulation. 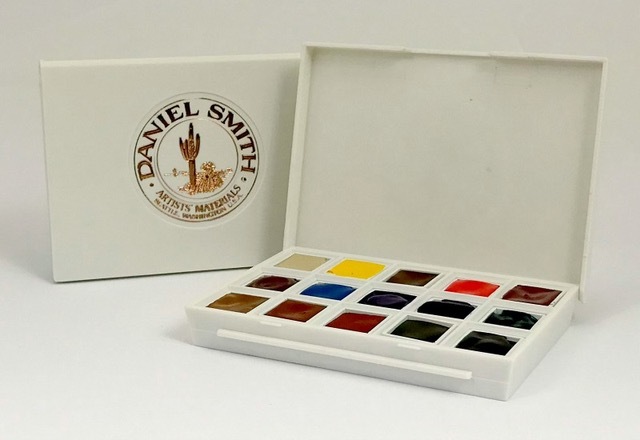 Daniel Smith Watercolours The Ultimate Mixing Set. Change the Hansa Yellow Medium to Quinacridone Gold for another lovely triad with more neutralised greens, and oranges. I love the earth triad made from Goethite, Indian Red and Cerulean Chromium. You could change the blue to Ultramarine for another variation. I enjoy using a triad like this when painting the southern Californian landscape. Goethite, Cerulean Chromium and Indian Red Earth triad. My 'Aussie Triad' is Permanent Alizarin Crimson, Quinacridone Gold and Ultramarine - this creates perfect neutralised greens, oranges and purples for the Australian bush, though it also works very well for many landscapes, including the colours of Oregon and Washington State. There are many other triads you could explore for wonderful colour harmony. 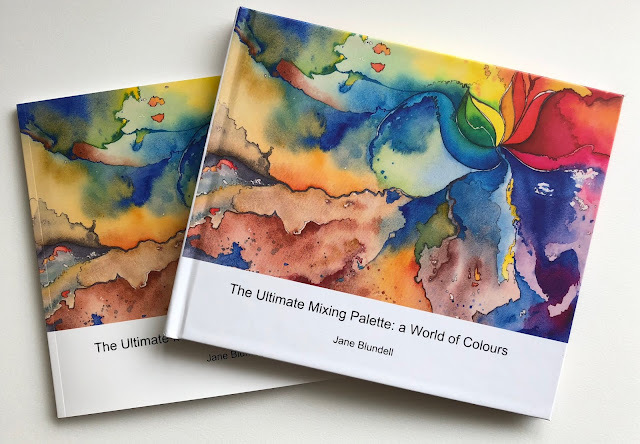 For more information about mixing the colours I've created a reference book which includes all 105 two-colour mixing combinations and the most useful three-colour mixes. It is available as an eBook, Kindle, hard cover and paperback. For more information see here. The Ultimate Mixing Palette: a World of Colours - available in paperback or hardcover. 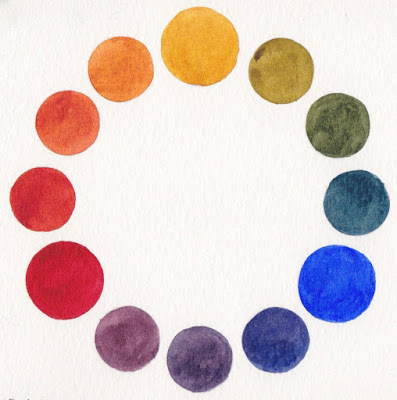 I have had your e-book for a while now, and it has become my go-to resource guide whenever I'm not sure about achieving a certain color in my painting. So useful! This is really inspiring. Thanks a lot for sharing with us the results of your hard work! This would open up new mixing possibilties for artists. I have learnt many things from your website. Thanks a lot, Jane. This is two levels above awesome. Whew. I can't imagine how much work this was. Thank you so much for all you do. These pigments are ootw (out of this world) lol. love them. My birthday is end of October and this will be a present to ME!! 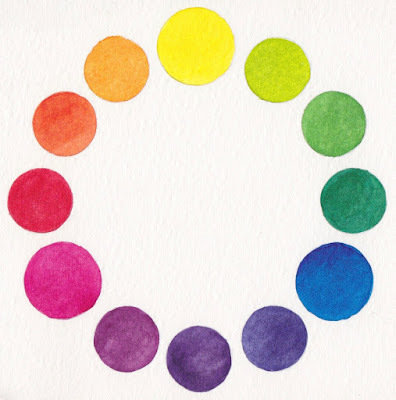 I absolutely Love Your color swatching!! !Such an inspiration for a semi newbie.I learn so much by recreating these myself....once you see it happen, you get it!!! This is how I learned fabric dying, a bunch if white 5 gallon water buckets and red blue, and yellow fascinating. Believe it or not, that made me into an expert haircoloryst in my profession for the next 30+ years. Love Color! Wow this is so helpful especially for a beginner like myself. Thank you for putting in the time to make these great examples.